A group of stones that is connected and has sufficient possibility to make eyes, is called thick or strong. Strength is the quality of a group to be hardly vulnerable to attack. The Black group on the outside is strong. It is connected and will easily make eyes at a and somewhere in open space. The White group can be said to be more than strong, i.e. alive. Empty points that lie in the vicinity of a (strong) group of stones of the same colour, say white, are likely to become territory. We say they are White's influence. The marked zones are clearly influenced by the strong black stones and likely to become territory. The range of Black's influence can be much wider, depending on the rest of the board. The area behind the White stones is more than influence, it is territory. The act of placing new stones on the board, creating a foothold for future stones, is called development. As soon as a group of stones has been formed, there is a sense of direction to this development. The influence exerted by a group, indicates the range and the direction in which a group wants to develop. 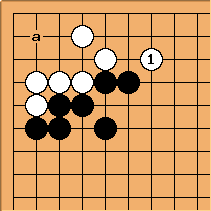 In Go, stones ideally develop along straight lines. Why is this so? The basic reason is that two adjacent stones of the same colour form a simple connection, sharing their liberties. Such a simple connection is strong. Two diagonally "linked" stones are not fully connected and do not share their liberties. However, one could argue that the diagonal is potentially connected and more flexible than the simple connection. So we have to find more arguments for the statement that straight is better than diagonal". In the upper left of this diagram, two groups run across the board, one diagonally, the other straight. They will meet halfway. The first one to play a will continue its development and block the other's. 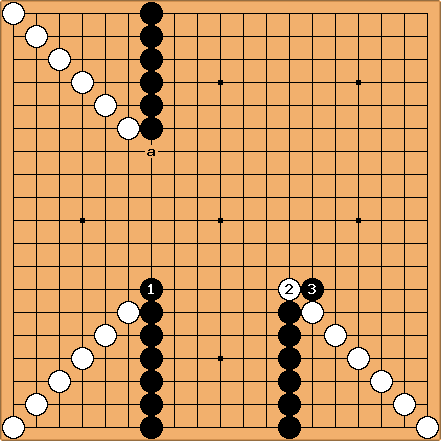 If it is Black's turn (below left), he will block the diagonal development, while smoothly continuing his own and the whole chain remains connected. If it is White's turn (below right), she will block the straight development, while continuing her own, but Black now can cut. Here is another way to expose the weakness of the diagonal. Both have used the same number of stones. Black can cut White all over the place, while Black is strongly connected. This is the basic difference between straight and diagonal: when they meet, the straight group can do more damage. Even clearer becomes the weakness of diagonal development, if both increase their speed and jump a point. The straight line now develops twice as fast, with one space jumps. If White tries to cut one of the segments, she is immediately reduced to two liberties. In the ensuing sequence, Black can maintain a high degree of connectivity. The diagonal line also develops at double speed, but when Black cuts it, he can do so while keeping a maximum of liberties. In the ensuing sequence, White's line of development is completely disrupted. 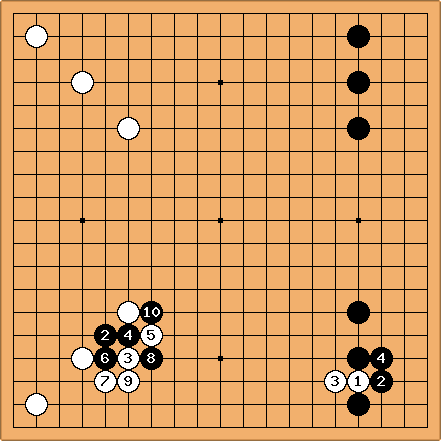 In the game of Go the purpose is fundamentally to put living stones on the board. However it is not possible to put many living stones on the board in one single act. Each newly played stone has a purpose (or function) and this function will always be somewhat biased towards either making existing stones alive (= stabilize) or create a foothold for future stones (= develop). This balance between stability and development is crucial in the game of Go. Stability results in the form of alive groups and thick groups. Development results in the form of territory and influence. Moves that provide stability to large, unstable groups are called urgent. Moves that create new footholds for development in large, undisputed area are called big. It is generally accepted that it is wizer to stabilize first, then develop. To develop first, then stabilize, is considered to be more difficult, if not counterproductive. Principle: play urgent moves before big moves. A position which is reached by continually emphasizing development at the expense of stability is called overstretched or thin. A position which has taken sufficient care of the stability of existing groups is called thick. However, there can be too much focus on stability as well, at the expense of development. Positions which over-emphasize stability are called overconcentrated or slow. A series of moves which has taken sufficient care of development of new areas is called fast. No one can really tell where the ideal balance between stability and development is to be found. A lack of balance, however, can often clearly be pointed out. In the above examples we encountered the notion of equivalence (miai). Moves that leave you with equivalent options, different moves to reach a comparable goal, are generally interesting moves. The player who starts has the advantage. So, if a position is equal in terms of territory, influence, strength and weaknesses, the player who has the initiative has the advantage. If a position is slightly unfavourable in terms of these criteria, the mere fact of having the initiative often cancels that out. In general, it is interesting to have the initiative. From the fact that stones are played in alternate turns, we can derive a meta-principle, namely that you should place your stones with a maximal effect. 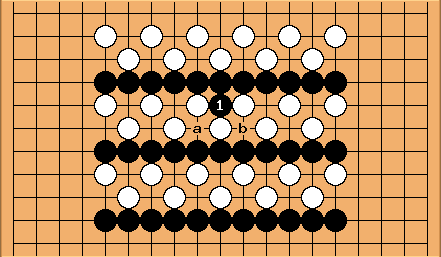 A player who sees a sequence giving him undisputed victory, will play out this sequence. This can be called settling the shape. If settling the shape does NOT give a definite advantage, then it gives more information to both players. In particular, when the shape is settled with one move, the opponent is the first to adopt a way of playing that takes the settled shape into account. Therefore, as long as it is unclear who is favoured by the board position, both players will keep their options open as much as possible. This applies also to parts of the board. In a sense, this principle extends the principle of connection with friendly stones to connection with open space. If the rules speak about capture, the true way of the game is encirclement. Although a White play at a would completely ensure White's territory in the corner, a play at avoids being surrounded. Thanks to , White will have influence along the upper side and playing at a may even not be necessary, so she increases her efficiency as well.